I know it has been a while but I have a brand new tutorial for you and it is only $2.50 as usual! 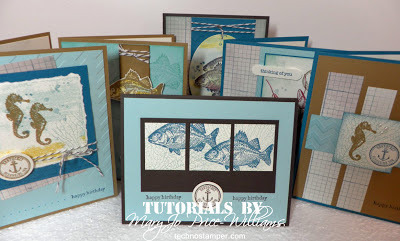 As I talked with a bunch of you who have been buying my tutorials many of you said you would love to just have card sets with a bunch of cards using one stamp set and a few papers and that you did not really care as much about the box or container to keep them in. So that is what this one is! (I will still be doing the other type too). So I hope you will give it a try. The tutorial contains step by step directions for six cards using the fabulous By the Tide stamp set! They are all of a masculine nature but can be used for anyone! You will get cutting sizes and step by step directions.